If we have the means to purchase a ticket to a much-awaited concert or a spectacular show we will definitely look for the seat with the best view. No one wants to be on the far side or a place where one can almost not see the performers. In the awful, disgusting, and eerie scenes of the crucifixion where do you want to have your seat? No one wanted to be there. Like most of Jesus’ disciples, we would probably be hiding in the crowd and quickly vanish away. The terror of everything that is happening around would surely send chills down our spine and instinctively pull our feet away. We do not want to be one of those hanging on the cross. If they can do it to Jesus, they could surely do to any of His followers. But what if we do not have a choice to leave? 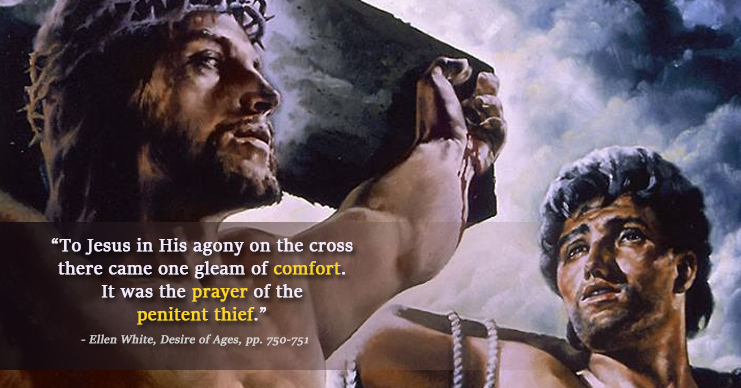 What if we were the ones sentenced to death through the horrible Roman way of crucifixion? Like the thieves hanging with Jesus that day, what do we do? Through the inspiration of the Holy Spirit, Ellen White explained why the repentant thief had the best “seat and view” in that climax of executing the plan of redemption. With humility of our hearts to the guidance of the Holy Spirit, may we find our personal best “seat and view” on the cross and experience again and again the love of Jesus: our Creator and Redeemer. Committed to celebrate God's goodness as proclaimed in the 3 angels messages in Revelation 14. Our God-given talents in the end times, are we hiding it?